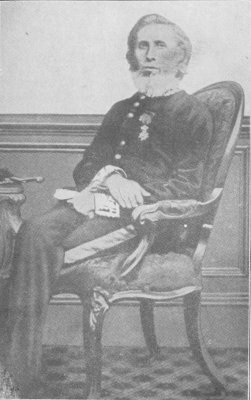 Sir William Robert Wilde (1815-1876) was one of the most notable aural surgeons during the second half of the nineteenth-century. He made numerous to aural surgery, including tables on the hereditary basis of deafness and newer hearing tests to determine degrees of hearing loss. Wilde also made extensive use of statistics in his writing, using numbers to support his analysis. As such, some of his work provides remarkable insight into how deafness—and the deaf—were perceived by the medical profession, categorized, and even treated. 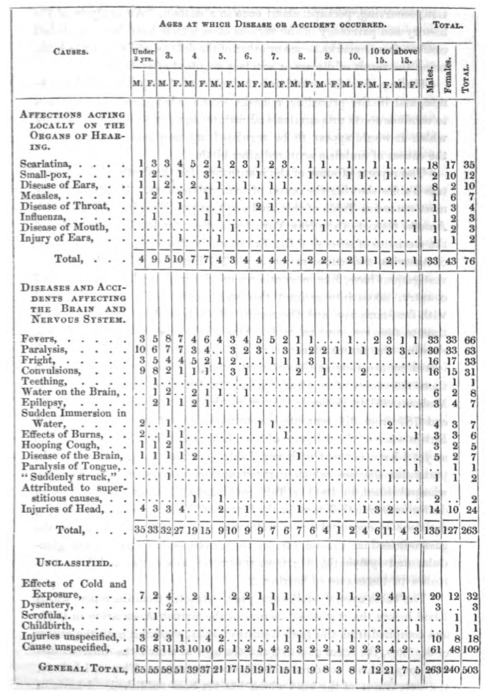 His statistical work, particularly his Report upon the Tables of Death (1843), which outlined mortality rates in Ireland, as analyzed from the 1841 Irish general civil registration. In 1850, Wilde was commissioned as Assistant Medical Census Commissioner, a position he would hold for the remainder of his life. As part of his position, Wilde undertook a special study of the deaf, attempting to table not only the number of deaf individuals in Ireland, but also the number of families with deaf relations, the causes of their deafness, the length of their hearing loss, etc. In short, Wilde aimed to provide the first systematic and comprehensive data record of deafness in Ireland. Only 1 family refused to give informed consent (to which they would have been subjected to a fine). Wilde recorded there were 4,747 “true deaf and dumb” in a population of 6,553,386 (or 1 per 1,380). The pamphlet also lists the questions that were employed in the data collection, including “Whether the person was born deaf and dumb, or became so afterwards?” “Whether the person is educated, and if so, where and by what means such education is acquired?” “The mute person’s position in the family, whether first, second, or third child, in a family of so many, both living and dead?” The questions served to collect as much data as possible, particularly on hereditary deafness, an interesting connotation to later data-collections of the deaf in the United States by the Eugenics Record Office. Robert J. Ruben, “William Wildes Census of the Deaf: A 19th Century Report as a Model for the 21st Century,” Otology & Neurotology 31 (2010): 352-359; 354. William R. Wilde, On the Physical, Moral, and Social Condition of the Deaf and Dumb (London: John Churchill, 1854).